I usually only follow Arctic Sea Ice March through September but this year (for obvious reasons) has me keenly interested in Antarctica. The JAXA measurement for December 20th 2016 is 3,164,640 km2 lower than the 2010-2015 average for this date & 2,289,662 km2 lower than the 2000's average for 12/20. I am starting to think that Antarctic Sea Ice might fall to or below one million km2 in February. What is everyone's opinion on this? play know it all and in the process mankind is using the bigger picture that is so much needed to make good decisions. to make this clear, i don't mean you, your post just gave me the trigger to repeat this whenever an opportunity occurs because IMO it's part of the problem that we so much specialize and in the process divide things that in reality belong very much together. 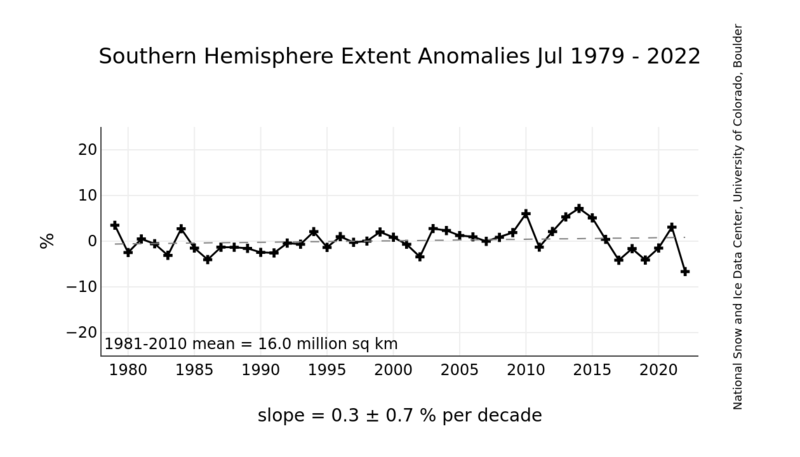 I have not been interested in Antarctic Sea Ice because those numbers have been very, very flat over the last 30 years, even though deniers love to talk about the tiny increase over time that is well within one SD. But you're right. If one is studying wildfire rates they should do so globally and not just those on their continent. For Dec. 21st JAXA has posted 7,008,635 km2 for SIE around Antarctica. Jaxa updated their image already today, but not the extent chart quite yet. For Dec. 23rd JAXA has posted 6,701,414 km2 for SIE around Antarctica. Down by 307,221 km2 since the 21st. For Dec. 24th JAXA has posted 6,441,674 km2 for SIE around Antarctica. For Dec. 25th JAXA has posted 6,285,842 km2 for SIE around Antarctica. Merry Christmas to the Antarctic in the form of a smaller drop! For Dec. 26th JAXA has posted 6,131,715 km2 for SIE around Antarctica. For Dec. 27th JAXA has posted 5,988,099 km for SIE around Antarctica. For Dec. 28th JAXA has posted 5,891,625 km2. Buddy & Co: in some years the minimum occurrs in the beginning of March. But most likely we will see the minimum during the last week in February. Btw, NSIDC reports a SIE of 6,061 Mn km2 for December 27. Should cross the 6 Mn mark by tomorrow. Will be interesting to see if we get below 16K2 in COMBINED sea ice (per Wipneus' graph). We really DO have two fascinating ice sheets to watch play out. 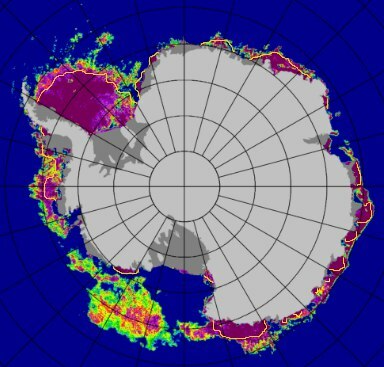 The Antarctic looks like it will REALLY have some significant "issues" in the next 1 - 5 years as the ice shelves continue to melt and crack away.....and the Arctic is looking REALLY WEAK on the Atlantic side and melt season won't start for another 6 - 8 weeks. I expect some huge drops ahead, simply because there are large area of ice already in bad shape. These are still showing up area wise because the concentration is above the threshold value. With additional some hundret Petawatthours that heated into these waters, because we had since mid November always 1.5-2.0 M km2 less SIE than usual, melting ends probably in March or as soon it is done completly. And I think REALLY, that not the antarctic and arctic will have issues in the next years, but we all. I'm not making any predictions now for February/March on the back of such unprecedented lead-in conditions, but I will be watching closely. Expect large drops in the remaining ice north of the Ross Ice Shelf starting shortly after new years. 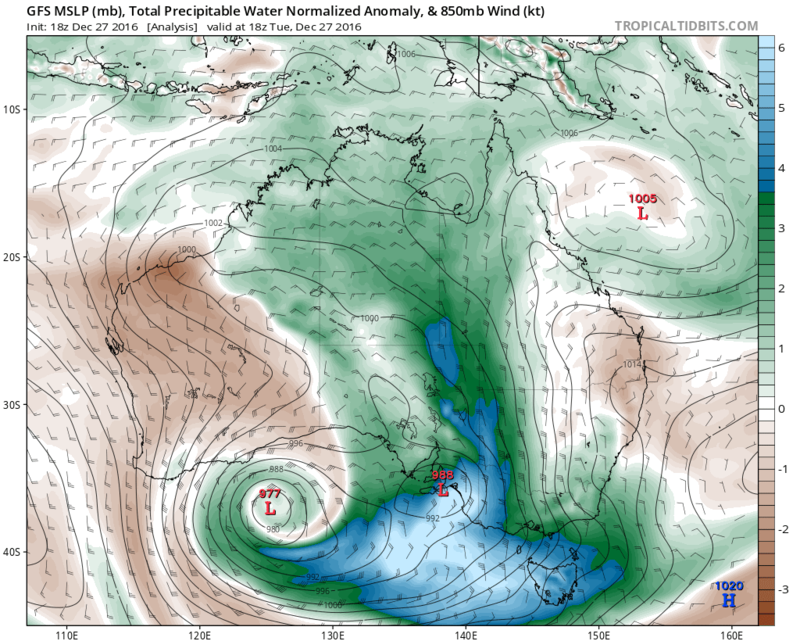 An extremely thick tropical plume of moisture from Australia is traveling with a low pressure down towards West Antarctica over the next few days and is predicted to deliver massive amounts of heat to the area of Antarctica around the Ross Ice Shelf and nearby areas in both the EAIS and WAIS. For Dec. 29th JAXA has posted 5,812,645 km2 for SIE around Antarctica. Water temps are generally up, in the open water areas surrounding Antarctica. Another 138K down. We are now at 5,826 Mn km2 for December 29. It's now very likely that the 5-day average for the first time will drop below 6 Mn km2 as 2016 ends. Interesting to see that JAXA and NSIDC daily values are so close to each other, only about 14K difference between them. For Dec. 30th JAXA has posted 5,687,501 km2 for SIE around Antarctica. If I make like a climate science denier, and cherry pick my dates, the decline is Antarctic sea ice extent can be presented in dramatically different fashions. As of December 30, SIE was 5.941 million square km. That's only down 7% in 37 years (versus 1979 - 6.376 square km). But if the comparison is versus 2013 SIE of 9.292 million square km, then it's down 36% in just 3 years. For Dec 31st JAXA has posted 5,556,992 km2 for SIE around Antarctica. NSIDC reported a value of 5,575 Mn km2 for December 31 while the 5-day average was 5,826 Mn km2, the absoutely lowest 5-day value on record. No SIE update from JAXA for a couple days now but they have updated the concentration map. The 5-day average is (manual estimate! ): 5,573 Mn km2. The daily value for January 2 is now 5,319 Mn km2. Of crucial importance for the final outcome of this melting season is what will happen to the sea ice in the Ross Sea. If it doesn't melt out virtually completely, I'm fairly confident that we won't break the minimum years. Since there are no numbers in from JAXA, I will just post an image updated through today. For Jan. 3rd JAXA has posted 5,148,723 km2 for SIE around Antarctica. And now JAXA has posted for Jan. 4th at 5,038,887 km2. Who knows? Here is what we do know. Thanks T-town for those insightful pics! Where do you find them? As for today, another 129K drop was seen around Antarctica according to NSIDC, the same as yesterday.We are now down to 5,043 Mn km2. By tomorrow, NSIDC will almost certainly report a SIE below 5 Mn km2. CMEMS. I learned about them from johnm33. For Jan. 5th JAXA has posted 4,968,665 km2 for SIE around Antarctica. For Jan. 6th JAXA has posted 4,926,275 km2 for SIE around Antarctica. 2006 was 4.88 so now only 2nd lowest on record for date. For Jan. 7th JAXA has posted 4,830,950 km2 for SIE around Antarctica. The odd thing about that is that on NSIDC's Charctic tool 2017 is well below 2006 for that date. Anyone have a guess as to why the two measures would differ so much? as far as i know chartic is a 5 days average, hence since this is the second day only that we're above 2006 in the daily values, it would (will) take another day or two to show in that chart. ready to stand corrected, this is just what came into my mind while reading the question. For Jan. 8th JAXA has posted 4,732,309 km2 for SIE Around Antarctica. Small question: As and when Larsen C breaks off and breaks up, would I be right in thinking this would count as an increase in sea ice extent? We have had similar discussions in the past. Some said yes and some said no. Personally, I would feel that it would be wrong to do so,as it would distort seasonal data. However after time went by and it broke up into smaller pieces and some, that didn't go out to open sea, got mixed in with the fresh ice from freeze season, it may become hard to distinguish it from the rest. The orange line in the picture is the possible minimum extent that could happen if the low-concentrated ice would melt completely. That would be about 2,1 mln sq km,a record low extent. P.S. I have often wondered how much the disintegration of the Larsen B ice shelf (and subsequent acceleration of surrounding glaciers) has contributed to the amount of sea ice in the Weddell Sea. (Area that was lost 3250km^2, + glaciers flowing up to 10 times faster, still giving 22-40 gigatonnes of ice in 2006?). Plus the increased albedo of ice/snow instead of open water which was visible before the collapse in 2002. For Jan. 9th JAXA has posted 4,613,991 km2 for SIE around Antarctica.